The New Humanitarian | Nodding disease or "river epilepsy"? Nodding disease or "river epilepsy"? A rare and unexplained brain disease has affected hundreds of Ugandan children, health workers say. The "nodding disease" causes seizures, and affected children become physically and mentally stunted, which can lead to blindness and even death. "Nodding disease" is not unknown to medical science, but the best-known concentration of cases had previously been reported from southern Sudan. A medical NGO in the Mundri area of western Equatoria had reported an estimated 300 cases around 2003. Northern Uganda's Kitgum disctrict, an area recovering from two decades of civil war, appears a new epicentre of the disease. Local leaders Obonyo Yokoyedo told IRIN that 200 children in his village of Okidi alone had the illness. "We have lost three girls... one drowned in a well during a seizure; the other two went several weeks without eating," he said. 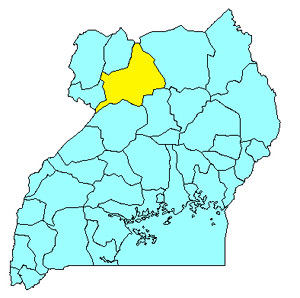 Janet Oola, Kitgum health officer, said hundreds of children had presented symptoms of the "nodding disease" in the district in 2008. "It is an early stage of epilepsy," she added. A likely cause of the disease is a neurological effect of the parasitic worm that causes Onchocerciasis (river blindness). Recently published medical research supports a link and doctors who have studied nodding in the field say the two are connected. Prof James Tumwine of Makerere University in Kampala, who participated in a WHO-sponsored investigation into the outbreak in Sudan, described the disease as a form of epilepsy linked to onchocerciasis. However he told IRIN he found it "incredible" that such a large number of cases were being reported in Uganda. "The infected children need immediate treatment for seizure and Onchocerciasis." Ugandan health ministry officials confirmed the disease had been reported in northern Uganda, but its cause was yet to be established. "It has spread to many villages in Kitgum, and we are working with WHO [World Health Organization] to establish the cause," Paul Kagwa, ministry spokesman told IRIN. "At the moment, it is still a mysterious disease." River blindness is transmitted by blackflies infected by the filarial worm Onchocerca volvulus. It is endemic in 30 African countries. A major public health campaign focuses on annual treatment with the drug Ivermectin, supplied free by manufacturer Merck & Co Inc. The programme in Africa has over 50 million people receiving treatment. A medical officer in Uganda's northern Gulu district, who preferred anonymity, told IRIN that cases of nodding disease had been reported in Awere village in 2008. A health ministry team visited Gulu, Kitgum and Pader and found that the disease was more common among people living near streams. Five streams - Pager, Lakankodi, Adinga, Lanyalyang, and Anyuka - cut across the affected villages. Proving the link has not been easy, and research into other possible causes such as toxins have not produced answers. An epidemiological study in 2004 was inconclusive. A study in December 2008 suggests that the "seizure disorder" had been reported in Tanzania as long ago as the 1960s and should be treated as a "syndrome" whose possible link to Onchocerciasis was "intriguing". In June 2009, a review of studies in eight African countries, including Uganda, looked at the statistical links between river blindness and epilepsy and found that for every 10 percent increase in the prevalence of Onchocerciasis, epilepsy rates go up 0.4 percent. The report's authors say they found "a close epidemiological association between the two diseases" in the data of over 70,000 patients. The study, in the PLOS Neglected Tropical Diseases journal goes on to suggest a new terminology: Should a causative relationship be demonstrated, onchocerciasis [...] could thus also be called "river epilepsy". Grace Lanyero, a psychiatrist at Kitgum government hospital, said food seemed to trigger off the attacks among the children she has seen. "This is a seizure which begins when the victim begins to eat," she told IRIN. "The child starts nodding with uncoordinated hand movements that don't reach the mouth." The affected children, she added, were being treated with anti-convulsive drugs and medicines to relax the muscles and control nodding. Christine Auma, 62, cannot understand what ails her two grandchildren, who have been bedridden for three weeks. The children nod endlessly whenever food is presented to them, and cannot eat properly. "I tried all means of treatment in Kitgum government hospital, but nothing [worked]," she said. "I even tried a traditional healer who slaughtered a black goat but nothing has worked." Evelyn Aweko from Pajule village in Pader District told IRIN that her 14-year-old son developed the complication in mid-2005. All attempts to treat him have failed. "He started presenting unusual behaviour; whenever food is brought for him, he nods and fails to put food into his mouth," she said. Sometimes, he would appear to have lost his memory, start nodding and eventually fall to the ground. The boy's father, developed similar symptoms and eventually lost his sight, Aweko said. The WHO website cites nodding disease as an example of a disease that is not fully understood.